The Brussels Griffon, also known as the Griffon Belge, and Griffon Bruxellois gained its name from its place of origin in Brussels, Belgium. The Brussels Griffon is one of three variations of Griffon, the other two being the Belgian Griffon and the Petit Brabancon. The Brussels Griffon is the only one of the three that is currently recognized by the American Kennel Club. 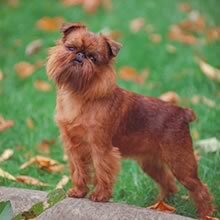 The Belgian Griffon has a longer coat than the Brussels Griffon and the Petit Brabancon has a shorter smooth coat. The Brussels Griffon was very popular in the 17th century with cab drivers that utilized them in their stables to rid them of vermin. Several other breeds may have contributed to the Brussels Griffon that you see today, such as the Affenpinscher, English Toy Spaniel, Belgian street dog, Yorkshire Terrier and Irish Terriers. The Brussels Griffon, while a fine companion, is not a terribly popular breed. It has gained some popularity after the appearance of a Brussels Griffon in the film “As Good As It Gets”, however, it remains a rare breed. As a side note, this breed also had a part in the First Wives Club and Gosford Park. The Brussels Griffon will typically reach heights of 7-8 inches and an average weight of 6-12 pounds. The Brussels Griffon's coat is wiry and rough to the touch. Common coat colors for the Brussels Griffon are red, belge, black and tan and solid black. The red coat is typically reddish-brown with black present on the chin and whiskers. The black and tan coat of the Brussels Griffon is black with red markings above each eye and on the chin and legs. The belge coat is a mixture of red, brown and black with a black mask. The Brussels Griffon has a very lovable character. They are very loving and affectionate with their owner. The Brussels Griffon is also quite curious and will be very interested in their surroundings. The Brussels Griffon does have the propensity to be quite sensitive and should be well socialized at a young age. The Brussels Griffon is one who will be happy to run the show, so it is imperative that you do not allow the dog to develop Small Dog Syndrome. A firm and consistent pack leader is a necessity. It is not recommended to feed your Brussels Griffon scraps from the table, as they may become picky eaters. The Brussels Griffon has a very lovable character. They are very loving and affectionate with their owner. The Brussels Griffon is also quite curious and will be very interested in their surroundings. The Brussels Griffon does have the propensity to be quite sensitive and should be well socialized at a young age. The Brussels Griffon is one who will be happy to run the show, so it is imperative that you do not allow the dog to develop Small Dog Syndrome. A firm and consistent pack leader is a necessity. It is not recommended to feed your Brussels Griffon scraps from the table, as they may become picky eaters. The Brussels Griffon, while very affectionate, is a one owner dog. They become very attached to one person and the rest of the family will never rank the same level of importance. Due to this, the Brussels Griffon may not be an ideal family pet. The Brussels Griffon can get along well with children as well as other small pets. However, the Brussels Griffon does not seem to be aware of their minimal size and should be watched to ensure they do not engage in aggressive behavior with larger dogs. You can find Brussels Griffon puppies priced from $500 USD to $2500 USD with one of our credible breeders. Browse through our breeder's listings and find your perfect puppy at the perfect price. The Brussels Griffon, while very affectionate, is a one owner dog. They become very attached to one person and the rest of the family will never rank the same level of importance. Due to this, the Brussels Griffon may not be an ideal family pet. The Brussels Griffon can get along well with children as well as other small pets. However, the Brussels Griffon does not seem to be aware of their minimal size and should be watched to ensure they do not engage in aggressive behavior with larger dogs. The Brussels Griffon's coat will require a good deal of regular grooming. The coat will need to be hand plucked on a regular basis and the beard will need to be combed daily to remove any food particles. The Brussels Griffon sheds very little and may be an excellent choice for those with allergies. The Brussels Griffon will do very well in an apartment and does not necessarily require a yard. The Brussels Griffon is quite intelligent and will be quick and eager to learn new tricks. However, this breed has been known to be difficult to housebreak. As stated previously, the Brussels Griffon requires a strong hand when training to prevent development of Small Dog Syndrome. The Brussels Griffon is a very active indoor breed. They will be happy to play inside all day long, however, they should still be taken on a daily walk. Brussels Griffon Puppies for Sale - Shipped Worldwide! Finding the right Brussels Griffon puppy can be dog gone hard work. PuppyFind® provides a convenient and efficient means of selecting and purchasing the perfect Brussels Griffon puppy (or Brussels Griffon puppies) from the comfort of your home, 24 hours a day, 7 days a week. Take advantage of our PuppySearch or leisurely browse our directory of hundreds of dog breeds, Brussels Griffon dog breeders, Brussels Griffon dogs for adoption, and Brussels Griffon puppy for sale listings with photos and detailed descriptions. Some Brussels Griffon puppies for sale may be shipped Worldwide and include crate and veterinarian checkup. Many Brussels Griffon dog breeders with puppies for sale also offer a health guarantee. With thousands of Brussels Griffon puppies for sale and hundreds of Brussels Griffon dog breeders, you're sure to find the perfect Brussels Griffon puppy.